What U.S. counties have the most people that are part of the labor force? You are at:Home»Demographic Data»National Data»County Level Analysis»What U.S. counties have the most people that are part of the labor force? The data for this visualization comes from the American Community Survey which is conducted by the U.S. Census Bureau. 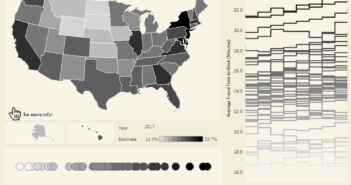 I used the Census Bureau API to pull the 2011-2015 5 year estimates for the percentage of people that are in the civilian labor force in each U.S. county. Only people 16 years of age and older are included in the universe for this percentage. Once I had gathered the data, I used Tableau to create this visualization. I have included the API code I used to pull the data below. Percentage of people in the civilian labor force is represented by DP03_0003PE. You will may a free API key to access the data. You can find out more at the Census Bureau’s Developer Page. Are Commute Times Increasing in the United States? 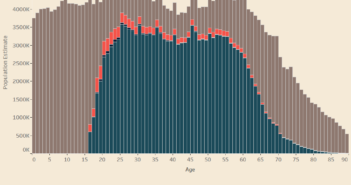 How does employment status in the U.S. change with age? What U.S. counties have the largest household incomes?